Hard themeless today, and a couple quick hits. Shall we? One sure-fire way to get my attention is to send a photo of yourself pimping the ole' BEQ name and/or crosswords. (Readers of the blog will recall Jimmy Dale and Kelly Reidy.) Say "hello" to Whitney Luther from Portland, Oregon. That's her up above solving my Times crossword puzzle from last Sunday when she should have been taking in the sites in the Big Apple. Whitney writes: "So, I've been planning a trip to NYC for a couple of months to visit my best friend who was recently transferred there (against her wishes) by Nike. Everyone kept asking me what my plan was once I was there. My response was the ONLY thing I wanted to do was pick up the Sunday NYT puzzle and sit down and drink a cup of joe and have a bagel with lox. Well, my boyfriend's dad who decided to join us wouldn't allow such lollygaggery and hauled us ON FOOT all around the city all day Sunday. 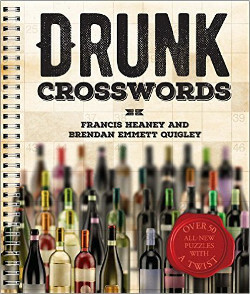 I kept having to pull out the xword at random sightseeing stops to work on it." That's the spirit! 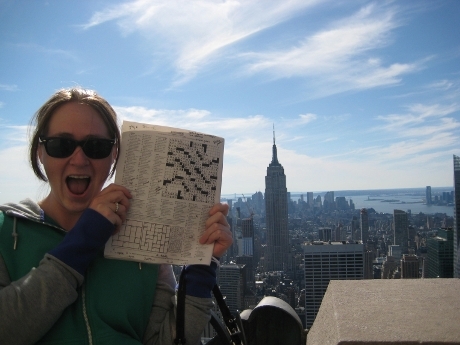 The NYC skyline will always be there but that crossword might not be. 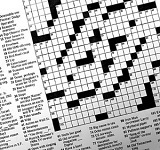 (Uh, Whitney: you do know you can get the Times crossword in Portland, right? In print even. Just sayin'.) For her promotional bravado, she will receive a copy of "Diagramless" (get yours in the store on the right). And, as always, please send your pictures in of you wearing a BEQ t-shirt or solving one of my puzzles and I'll run them here. Hat tip to reader Alex Chiang for this inspired Tweet. I see a bunch of spam accounts promoting Joseph Crosswords (who?) and Sheffer Crosswords (who?) that say pretty much the exact thing Alex said. So, if you're so inclined, why not start tweeting your results to the BEQ puzzles as well. I somehow missed the story about the Sudoku championship cheater, or else I might have spoken about it earlier. All that work for what, $3000? Unbelievable. Story is here. Thomas Snyder's live journal is pretty amazing too, many posts, the first of which starts here. New Visual Thesaurus puzzle is up today, go get it. The Peter King story refuses to die. Listen to him wax poetic about the puzzle on WEEI here (Start at 20:20). Finally, thanks to all who were able to contribute this week. If you haven't already, please consider a tip of any size as it helps the BEQ.com run smoothly, independently and fiercely thumbing its nose at conventions (have you done today's puzzle yet?). And one lucky donor will receive a t-shirt of their choosing. So just think: if you win, and you take a snappy picture of yourself in said t-shirt, I can run it here. If you can't contribute, you can help out immensely if you tell just five people about this site. Thanks.